Comfortable and chic, that is what the traditional kurti is to me. I love my kurtis and reach out a lot to these elegant and versatile indian clothing. I love how my tummy fat stays hidden in those kurtas and how I can wear them in all seasons and style them in a variety of ways. I have already written about edgy ways to style kurtis and today Iam going to talk about styling the long kurta in detail. A little mix and match, a wee bit of experimenting and you can create unique stylish looks with a simple long kurta. 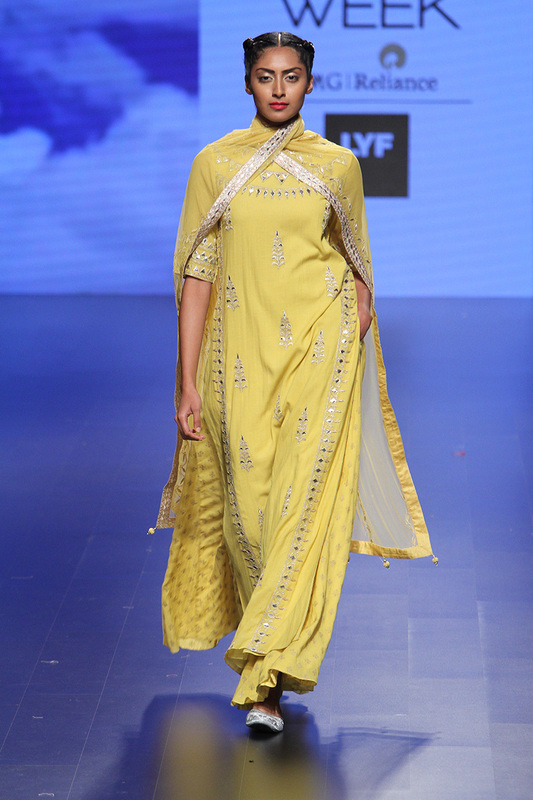 For a more dressed up look you can pair your long kurta with a flared out plain lehenga. The combination of long kurta with lehenga is a rage at present and I have spotted many bollywood celebrities also go this route. For a breezy summer wedding look pair a nice chikan long kurta with light weight lehenga. If you want to wear lehenga kurta combo for sangeet or cocktail then pair a silk long kurta with brocade lehenga (in contrasting colour) and skip the dupatta. Dont forget to add a bit of height with heels or wedges to balance out the volume. Comfortable palazzo pants are in trend these days and you can flaunt this trend the desi way by pairing with long kurta. Palazzos can add a wee bit of drama to your casual outfits and they look great on all body types so more reasons to pair them with your long kurtas. When trying the palazzo and long kurta combo contrasting is the way to go. 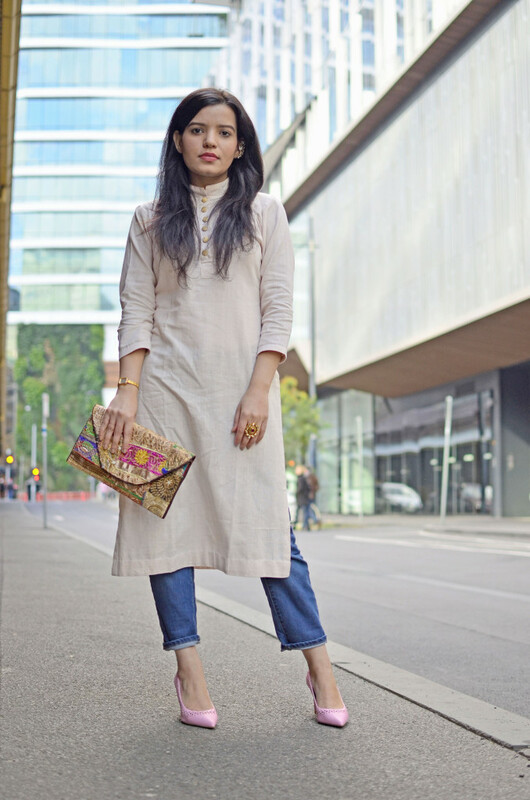 Kurtas which are long can be worn without bottoms like a indo western fusion dress. 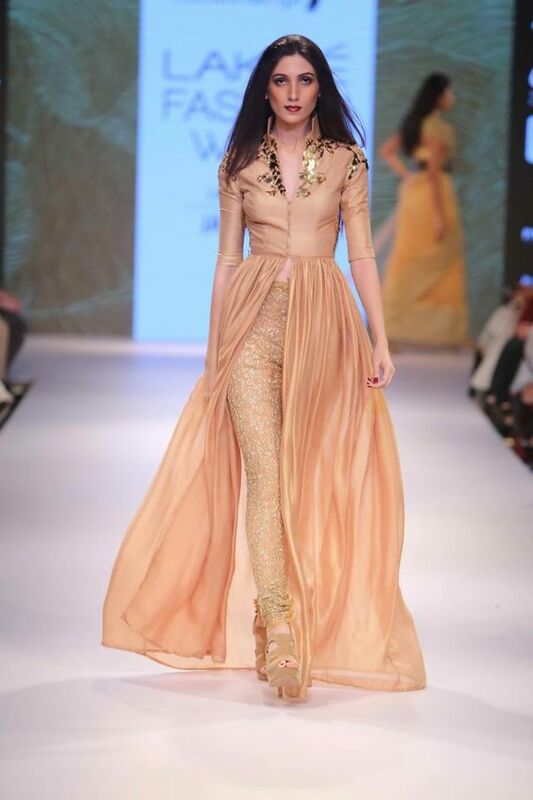 To style a long kurta like a dress choose one without slits on the side and pair with boots, gladiators or sneakers. This is best for summers where you can just skip bottoms and add a pair of flats and tada you are ready to head out. Long flowy cape style jackets are in trend these days and you can wear this trend with long kurtas as well. Play with colours by pairing a contrast coloured georgette long cape jacket with a kurta or go for an ornate embroidered long jacket with kurta for modern ethnic look. For a office look pair your cigarette pants with kurti and skip the dupatta. A tight top knot and a statement long neckpiece can complete your look. If you dont want to wear a necklace then go for simple stud earrings to complete this contemporary ethnic look. For a comfortable look you can turn to leggings which can be paired easily with long kurtas. If you are slim then leggings are your best option as bottoms with too much volume can overwhelm you. Even with leggings you can try new styles like lether leggings for glam look or printed leggings for a funky look. Sheer paneled leggings are also quiete in these days, you can pair then with you asymmetric long kurtas of long kurtas which have high slit in the middle. When wearing a kurti you can change the look just by draping the dupatta differently. Try new dupatta drape styles like v drape, criss cross drape etc or switch up the dupatta and opt for new colour combinations. 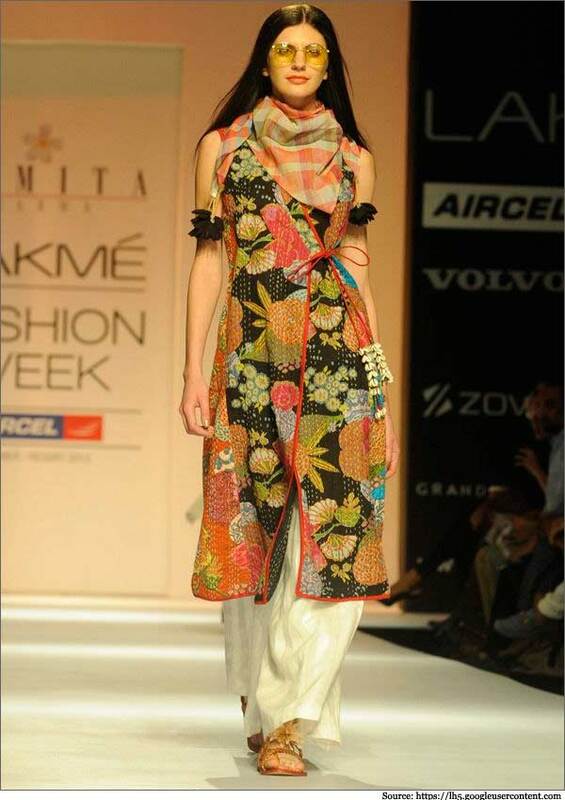 When you are wearing a long kurta you also have the comfort of skipping the dupatta completely for a casual look. For summer it is best to opt for breezy bottoms like patialas and harem pants which are super comfortable. Patialas have lots of pleats and volume which look good when paired with short kurtas but you can even pair them with long kurtas which have high slits on the side for an uber traditional summer look. Style is all about thinking out of box so I had this idea of adding a belt to a kurti look and it actually looked great. 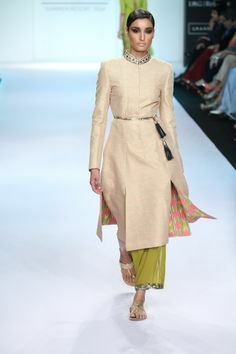 Long kurtas cinched at the waist will look great especially if your kurta has a defined waist line. go for broad belts for a rugged look or embellished ones for a more dressed up look. You can even use the kamarbands you wear with sarees for festive look. 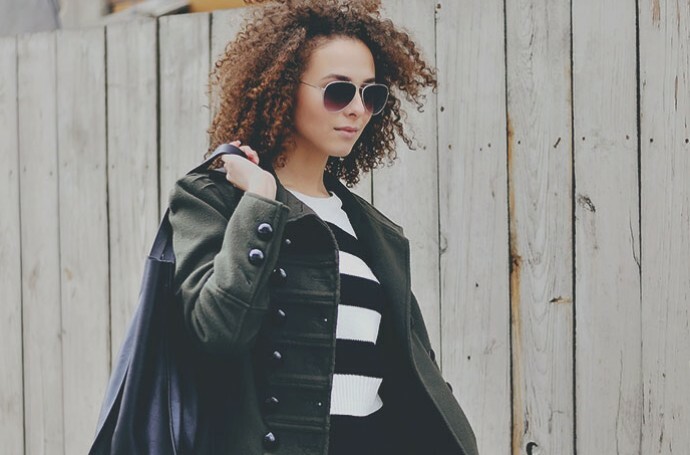 Wear scarves in contrasting colours or prints around your neck for a vibrant winter look. You can try this look in places like bangalore where it cold in morning and baking hot in afternoon. Tir the scarf around neck in morning and in afternoon remove it and put in your hand bag or tie it over your head if you are travelling to protect your hair from sun. - Contrasting is always a great idea when styling outfits but it is also good to pair same colour kurta with bottoms and add a pop of different hue via accessories, makeup or even a stole. - Most women prefer printed kurtas paired with plain bottoms which makes the mix and match easier but it is nice to experiment with printed bottoms once in a while. Try printed palazzos or leggings with lace borders for a change. - For formal wear you can try kurtis in light colours with a collared neck and pair them with solid cigarette pants or leggings. Wear heels or pumps for more office appropriate professional look. - When shopping kurtas be open to trying new styles and silhouettes . 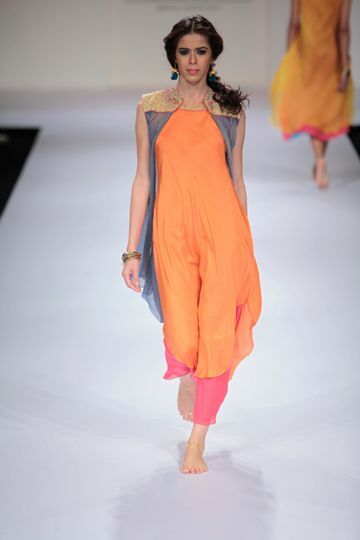 Asymmetric hemlines, long kurtas with a slit in middle down from waist line or belted kurtis look very contemporary.  -Accessorizing an ethnic look with jewelry is important. Go for delicate jewelry for office wear and for more casual events experiment with statement neck pieces and ear cuffs. Oxidized silver jewellery look great with solid kurtas. -Print on print can look very crowded butif you mix subtle prints with bolder ones it can actually work well. We normally pair a plain kurta with printed bottoms or printed kurta with plain bottoms but try the print on print combination for a jazzy funk look. 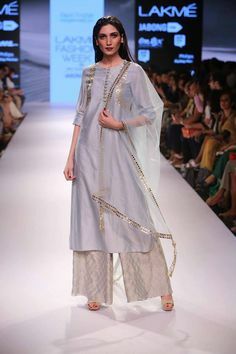 Have more ideas to style long kurtas? Share them with me in comments below.